Based on what they Google, Americans are looking for a variety of ways to secure their pets in transit, Germans are looking to augment the audio in their vehicles, and Japanese consumers want customization for comfort in their commutes. In Google's first Auto Trends Report, released last week, consumer preference is tracked in three of automotive's main marketplaces based on the top searches for vehicle accessories. Analysts sifted through billions of searches compiled between September 2015 to August 2017, tracking when, and why, interest in certain products rose or fell. Google did not quantify the number of searches constituted in their report. In addition to data pulled from Google and YouTube searches, researchers interviewed 1,000 consumers from all three markets to qualify the results. 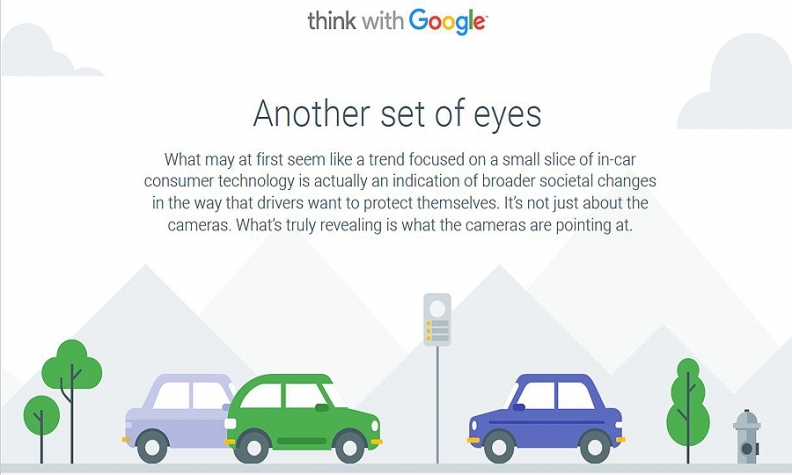 Across all markets, according to the search engine, consumers want on-board cameras on their vehicles. On-board cameras could provide driving assistance and additional security in the case of an incident. "What this tells us is that the car alarm is no longer enough -- consumers are bolstering surveillance with on-board cameras, to monitor their cars from afar and capture evidence," the report said. However, one of the biggest in-vehicle search trends that centered on cameras has less to do with safety and more with posterity. Documenting moments behind the wheel, hands-free, is a growing desire among vehicle owners. "We are seeing on YouTube -- this isn't quite documented in the report because the data is quite low -- but people are uploading and documenting their joyrides and road trips," Yarden Horwitz, Google's trendspotting project lead, told Automotive News. "It really speaks to the mindfulness culture, and people really taking in the view." The average American was 36 times more likely to search for pet-related vehicle equipment, such as dog harnesses, dog car seats and dog car hammocks, than a person in Germany. American consumers are 10 times more likely to search puppy protection than their Japanese counterparts. Ranked by volume of searches, the top five consistent terms Americans are Googling are car wraps, steering wheel covers, car air fresheners, aux cord adapters and dog car seat covers. There has been a drop-off in searches for car stereo and radio systems, body and turbo kits, and custom fit seat covers, particularly fuzzy ones. In Germany, digital audio broadcasting pulled the highest volume of in-vehicle accessory searches due to a 2010 countrywide initiative to switch all radio and TV signals to digital. Year-over-year, Google searches for digital automotive audio systems have grown 41 percent. In Japan, consumers are twice as likely than Americans to customize their vehicle, and five times more likely than the average car shopper in Germany, the study finds. Searches for personalized car seat covers, curtains, humidifiers and refrigerators trended in the country.